Home News BLACKPOOL HERE WE COME! This issue is a special “end of season issue” with the Independent boys looking forward to a weekend in Blackpool after the last away game of the season at Everton. The editorial reminds us that fancy dress is required at Everton with Harry Enfield “Scouse” costumes the order of the day. Music lovers were in for a treat, the bearded David Johnstone had produced a single remix version of the Liquidator priced at just £2 including postage and packaging. I got my copy on 7” vinyl. Probably the last 7” record I ever purchased. The Jason Cundy sale to Spurs angered many fans especially when the club announced that he had signed a four year deal with the White Hart Lane outfit. “Cundygate” was the big issue of the moment and much of the anger was directed at the now dearly departed Ian Porterfield. Robert Ransom of Gillingham says “Bring Back Cundy”. He asks “What is Porterfield on?” Selling Cundy for just £750,000 is criminal. Robert ends his feature by asking Porterfield to go. David Moran from Dublin writes in disbelief. 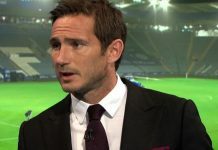 Porterfield had stated that the end of season sales were to make way for a new era in which he (Porterfield) will lead Chelsea to the Championship. David is quite puzzled as to why selling an England U21 centre half would help to achieve it. Peter Watts of Cheam wonders why he still supports Chelsea. He accuses Chelsea of inept management at every level. He’s also worried that other players such as Le Saux, Elliot and Townsend would follow Jason out of the Bridge. Nottinghill’s Paul Savage thinks Porterfield was p**sed when he sold Cundy. Howard Kallender of Kingston thanks Chelsea FC for kicking him whilst he was down. Howard still hadn’t recovered from the FA Cup replay with Sunderland. He was also annoyed by the sale of Clive Allen to West Ham. Dave Pearson from Blackburn revised his opinion of Ian Porterfield and wanted David Webb to take control of the team as he was doing a great job with Southend. Andy Sharks of Boroughbridge thinks that the money from the sale of Cundy et al went towards buying the Bridge from Cabra Estates and was worried about the future of the club. Tim Phillips writes a feature called “Another Season Full of Dejection” He raises a few points. Andy Townsend had a crap season and needs his backside kicked. He may be desperate to win something but didn’t look that desperate at Sunderland. The much maligned Dave Beasant had a superb attitude at Roker Park and convinced Tim that along with, Elliot, Wise, Clarke and Steve Clark, Dave is the sort of player needed at Chelsea. Tim’s not too bothered about Kevin Wilson being sold and understands that Clive Allen was bought as a stop gap. Tom Boyd looked a good player but was right footed in a left back position. Tim was stunned with the purchase of Tony Cascarino who was only good for a high punt. Tactics wise, Chelsea are playing the least attractive football in his 15 years as a fan. Tim describes the football played as, Hoof, Welly and Punt. Farnborough’s Steve Jefferies picks his team for the following season. He wants to sell Townsend, Beasant, Wise and Cascarino. The new arrivals would be: Tim Flowers, Dave McPherson, Merson, Davis and Terry Phelan. Here is Steve’s suggested formation. Mark Wheeler reports on the games played over the last few months of the season. Can any of you remember these fixtures? Mark didn’t make this game as he was watching Inspector Morse. Vinnie Jones was missed in midfield. Bates had asked fans to turn up early for this fixture. The pre-match entertainment was Stamford letting little kids score easy goals past him. Two of Chelsea’s best players sent of for foul and abusive language. Too painful to mention. Even 19 years on. A rare goal from Jason Cundy. Mark Wheeler befriends Neil Barnett on the way home. Two goals in one game! Clive Allen got a nice reception and typically scored against Chelsea just a few weeks after he left the Bridge. Spirited singing of “We won the Cup!” and “One David Webb!” were the highlights. Remember when Brighton were nicknamed “Chelsea on Sea?” M R Chivers from Brighton reminds us why. At the time ex-Chelsea player Barry Lloyd was manager and the following playing staff had played for both over recent seasons: Chris Hutchings, Dale Jasper, Keith Dublin, Clive Walker, Perry Digweed, Gary Chivers and Teddy Maybank. The Chelsea Independent raised £250 for Aldershot Supporters Club. The fund raising by Aldershot enabled the players to get paid but was not enough the save the club. D Morris of Basingstoke highlighted Alex Ferguson’s remonstration to the linesman after Manchester United had a goal disallowed against Chelsea. The FA said that they would not press charges against Ferguson. Some things don’t change. Jason Watkins kept an eye on Eddie Newton’s loan spell at Cardiff. Eddie had made 18 appearances and found the net 3 times. That’s it folks. More Chelsea Independent reviews very soon Let me know what you think.